The Indian Equity Markets witnessed immense volatility on Monday as the benchmark NIFTY50 nearly swung 300-odd points on either side before settling with a net gain of 55.50 points or 0.54%. The NIFTY saw a gap down opening, directly tested the 100-DMA and then recovered form that levels once the ruling BJP showing improved margin over the Congress. The volatility was expected but the quantum remained much larger than expected. Tuesday will continue to see volatility ingrained in the Markets but may continue to trade with positive bias. The Markets witnessed huge spate of short covering from the opening lows and this is likely to see follow-up up move on Tuesday as well, at least in the initial trade. 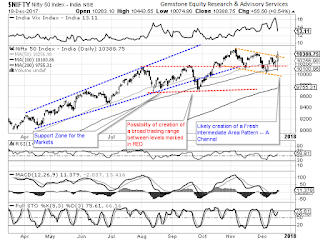 The levels of 10435 and 10490 will act as major resistance area for the Markets. Supports come in at 10350 and then at 10275 levels. The Relative Strength Index – RSI on the Daily Chart is 58.9091 and it has marked a fresh 14-period high which is bullish. The Daily MACD is bullish as it trades above its signal line. The Candles showed formation of a bullish engulfing pattern. However, the place of its occurrence makes it relatively insignificant. The pattern analysis shows that the Markets have managed to move up of the falling channel that it had created as a part of the intermediate trend. Further to this, the RSI has broken out from a pattern in which it was marking lower tops. All this point towards the follow up move spilling over into Tuesday’s trade as well. The volatility being discounted and if we look at the macro picture, the BJP’s win will not be viewed too favorably by the Markets in the long run. The method in which the BJP’s majority was dented as compared to 2012 will instill lot of caution into the Markets and will lead to volatile churning of portfolios. We may see some positive bias going into trade on Tuesday, but each moves should be used to protect profits at higher levels. 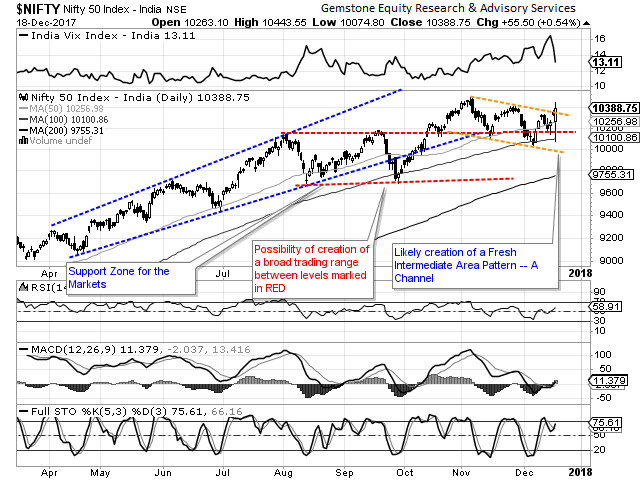 Caution is advised and we expect Markets encountering resistance once again as it approaches higher levels.